Home > Small Claims > Small Claims Advice: Is Your Claim Valid? The single most important question to ask before taking a case to court is whether there is a valid claim. In some situations it may seem obvious that somebody has done something, or failed to do something, which gives rise to a claim in law. However, just because a person has been dishonourable or done something objectionable, it does not necessarily mean that what they have done is legally actionable. Even if a case appears to satisfy all the criteria for the small claims track, it does not follow that going to court is a decision that should be taken lightly. Pursuing any case is likely to take considerable time and effort. Even in small claims cases it costs most people money to issue and prepare a claim. Further, once a case has been issued it may become clear to the court that, although it comes within the financial limits for a small claim, it contains complex areas of law making it unsuitable for the small claims track. What seems straightforward to a lay person might not be straightforward at all. If advice is paid for in a small claims case this cost can almost certainly not be recovered from the other side, even if the claimant wins, because of the special rules on costs that apply. However, if in any doubt about the merits of the claim - or whether all alternatives to issuing a claim have been exhausted - seeking advice at the outset could avoid delays, expense and misery later in the process. For most people the cost of retaining a solicitor to deal with a small claims case will be wholly disproportionate to the amount of money involved in the claim. Solicitors' services are not cheap and their fees may simply be unaffordable. However, in some cases seeking the advice of a solicitor at the outset could save time and money at a later date. Most solicitors will be happy to give an hour or two's advice on the merits of a claim and the approach to be taken for a one-off fixed fee. People on benefits or low incomes may be entitled to free help in preparing their case or even representation at court through the legal help or representation at court schemes run by the Legal Services Commission (LSC). To obtain Legal Aid, a person must approach a solicitor or qualified legal adviser who has a contract with the LSC to provide legal services under the scheme. The solicitor or advisor will provide an application to be filled in by the person seeking advice which will be used to determine whether or not they are entitled to Legal Aid. If a legally aided person subsequently receives money as a result of winning or settling their case they may have to put some of this towards the solicitor's fees. Because solicitors are likely to be paid less for legally aided work they do not all offer this service. The Citizens Advice Bureau (CAB) offers free advice to people on a wide range of subjects both through their Bureaux, located throughout the country, and via their Advice Guide website. For many types of claims they will be able to give advice on negotiating with the other side, the legal merit of a claim and the process involved in starting a claim. CAB receives funding from the government and other sources, and is a registered charity. Community Legal Service Direct, now known as Community Legal Advice, gives free and confidential legal advice either through their website, by telephone or at one of their law centres. In addition they can help people find a solicitor or adviser in their area. They can assist with a wide range of legal topics, including criminal law. Community Legal Advice is funded by the Legal Services Commission. Law Centres exist to provide legal expertise to the socially disadvantaged and those who might otherwise have no access to the legal system. They employ solicitors and barristers at centres throughout the country - although they are usually located in towns. 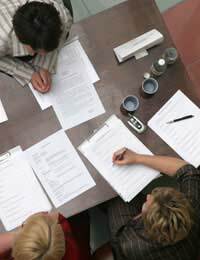 Law Centres specialise in social welfare cases, including those relating to housing and employment, or cases which involve issues of public rights. Law Centres are largely funded by the Legal Services Commission and local authorities. Other organisations who may be able to advise someone considering starting a court case include consumer rights groups, trade unions or professional bodies, motoring organisations, insurance companies and money advice centres. @Stevo - if you win then the company will be ordered to pay. If they do not pay then you have a few options including a warrant of execution which gives the court bailiffs the authority to seize goods from the defendant's home or business (restricted items) to sell at auction. A third party debt order which freezes money held in the defendant's bank account from which the money owed is extracted then paid to you. Also there is an attachment of earnings order where money is deducted from the defendant earnings and send it to a collection office. All have additional fees in order to implement then. Let's hope it doesn't come to this and that if you win, you will get the money you are due. Hi i have just issued small claims proceedings against a bathroom supplier in Maghull Merseyside at a cost of £60. If my claim is successful and i see no reason why i should not succeed.what steps can i quickly take to recover my £750 in full ?. Can i serve the other party with a winding up order of that company if they fail to repay me in full. Stevo.